If you haven't already read part 1 of this series, you can start here. Good organization is not just about fitting your carefully curated set of kitchen tools into your space—it's about making your space easy to use. A kitchen tool isn't worth its weight and the space it takes up if you have to dig for it when you need it. 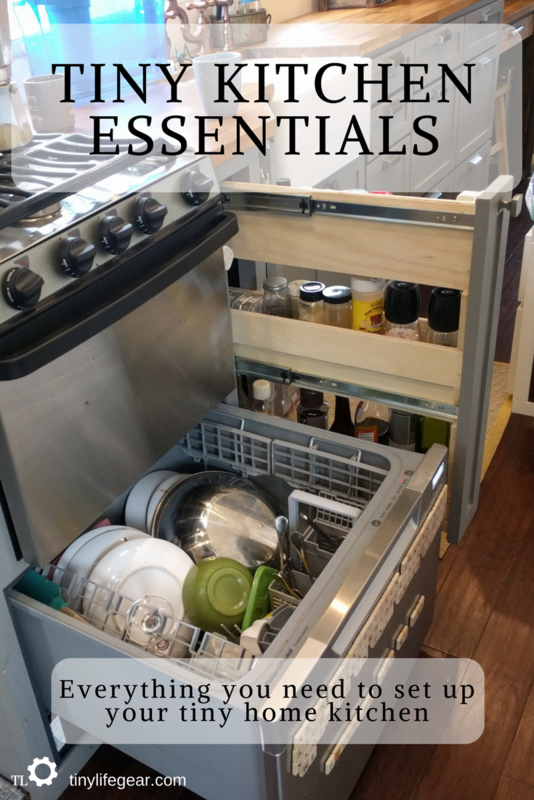 A well organized kitchen will keep everything you need within arms reach while you're cooking, and will make you forget you're working in a small space. I see lots of tiny houses and full-time RVers with magnetic bars in the kitchen for storing knives. Knives are sharp and have easily damaged edges, so I prefer to keep mine securely in a small wooden drawer knife block. 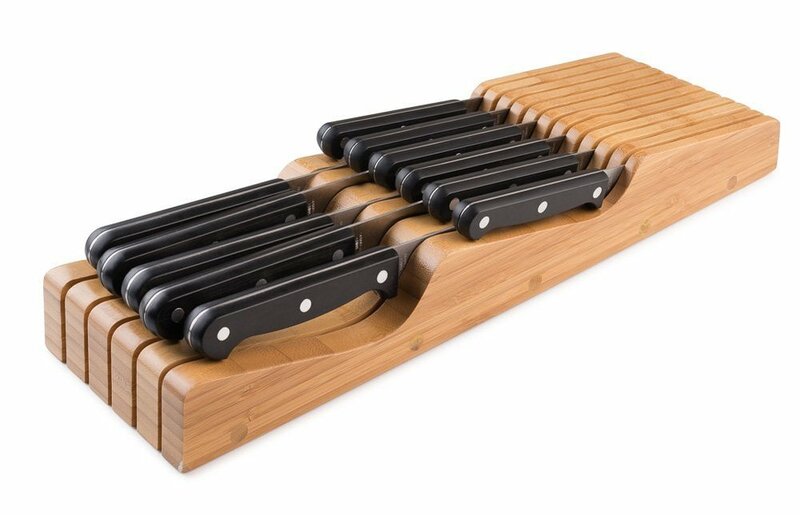 Just make sure the knife block is taller than the edge of the knife, so you don't accidentally cut yourself when you reach in the drawer.. For a starter kitchen, you'll want a good chef's knife, a paring knife, and a honing steel to maintain them. I also have a santoku, a long slicer, a boning knife, and a bread knife in my drawer, but those can be added as needed. You'll want at least one cutting board that's big enough for your chef's knife to fit diagonally. Lots of people have pretty strong opinions about using wood vs plastic cutting boards. I prefer the Epicurean cutting board, which is made with wood fibers, but it's nonporous and can go in the dishwasher. I like this model that has a channel in one side to catch juices when you're carving meat, and is flat on the other side to make it easy to slide things off the edge when you're cooking. Flexible cutting mats can be a great addition to a tiny kitchen. 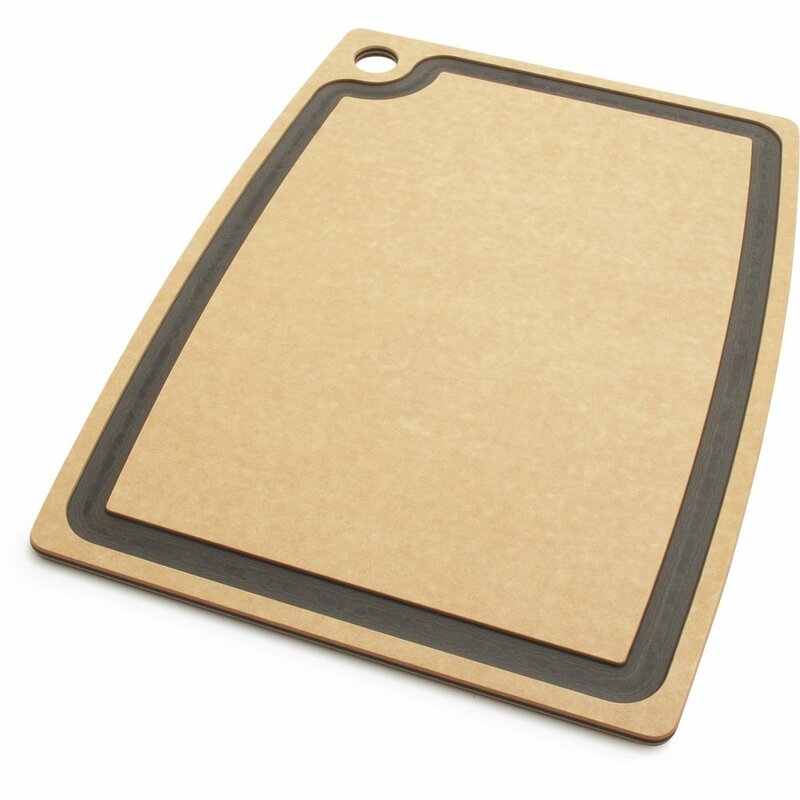 Cutting mats are especially useful when preparing food since you can lift the mat and roll it like a funnel to transfer your food to another container. They won't last as long as a real cutting board, but they're easy to clean, lightweight, and take up negligible storage space in your kitchen. Whatever you do, don't use a glass cutting board. They're heavy, fragile, and they will positively destroy the edge on your knives. I don't know what glass cutting boards are good for, but they're about the worst thing you could use for a cutting surface. I do use a magnet bar in my kitchen for storing cooking utensils. This model has both magnets and hooks to hold your various utensils. Kitchen shears, a wooden spoon, tongs, a flexible slotted fish turner, rubber spatula, ladle, and a whisk are all small kitchen essentials. 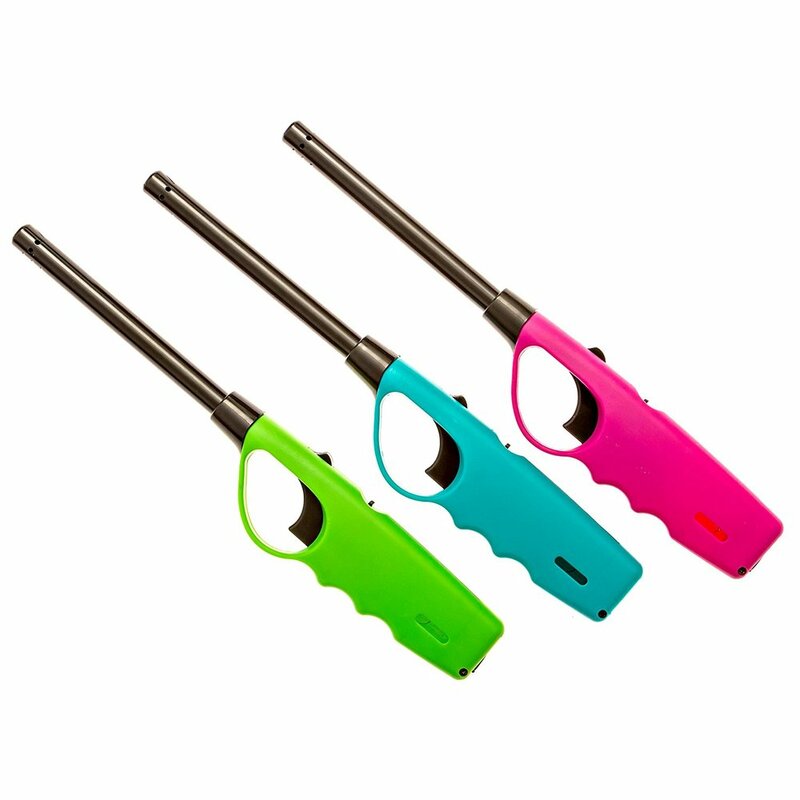 If you have a propane stove with a dodgy igniter or a pilot light, you'll want an aim-a-flame style lighter within reach of the stove. Get a refillable model to cut down on waste. If you're into creme brulee, or just want an excuse to have a blow torch in the kitchen, you can pick up a culinary blow torch instead. 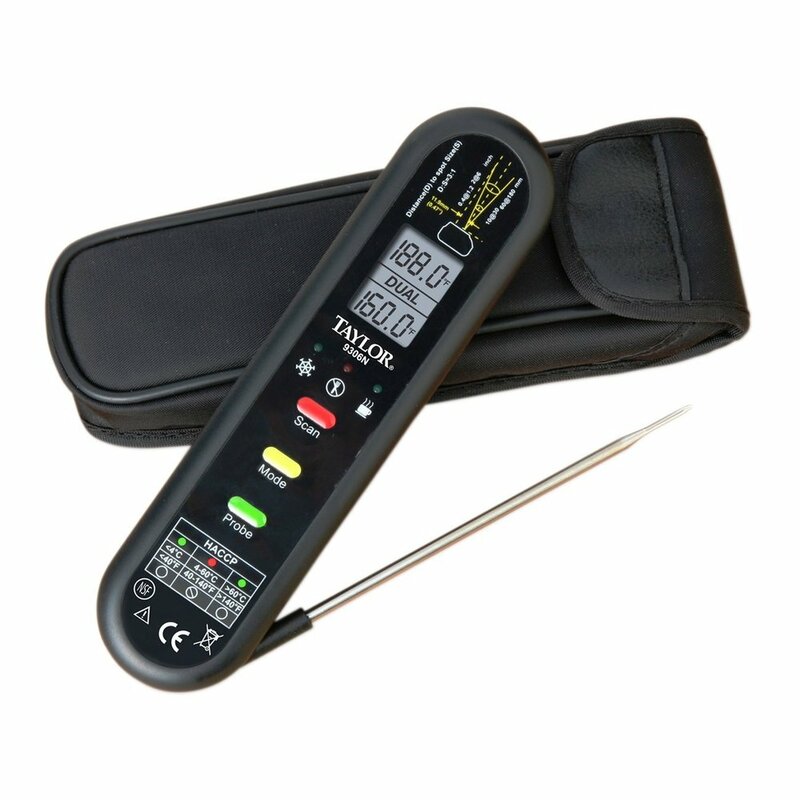 Also kept within reach of the stove should be a good instant read thermometer. Organization can be a challenge in a tiny house fridge. A small bin for meat storage can catch drips, so you don't have to worry about putting raw meat above other items. A produce keeper bin takes up a bit of space, but it can keep your leafy greens fresher longer. Various sizes are available, so pick the largest one that fits in the space you have available. 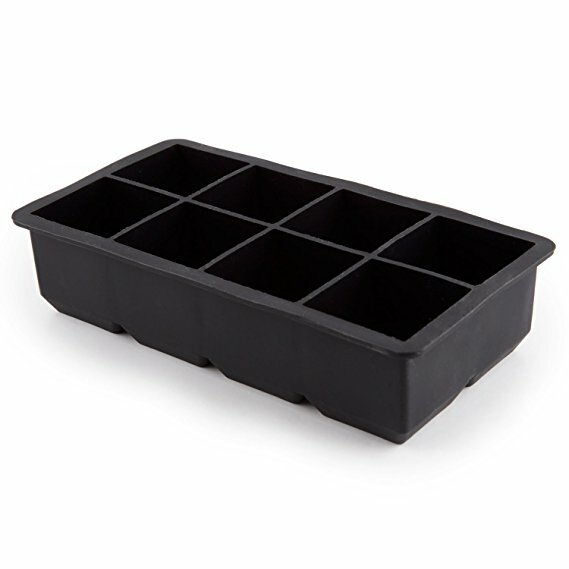 These silicone ice cube trays are more compact than standard trays, and they make larger cubes which melt slower in your drinks. 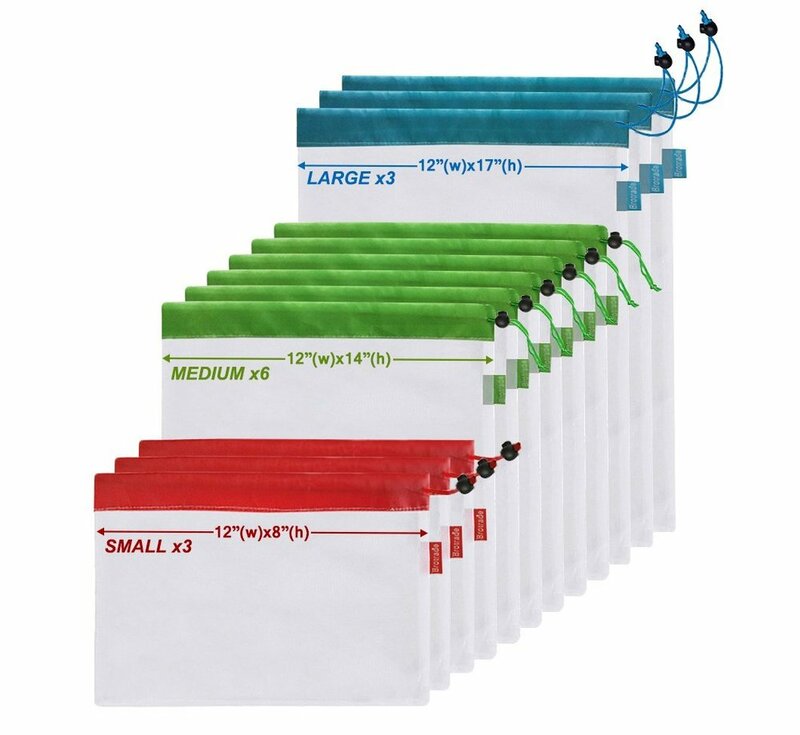 For food storage, these reusable silicone storage bags beat tupperware for using up less storage space, both in the drawer and in the fridge. They're dishwasher safe, and can even be used in a hot water bath with an immersion circulator. 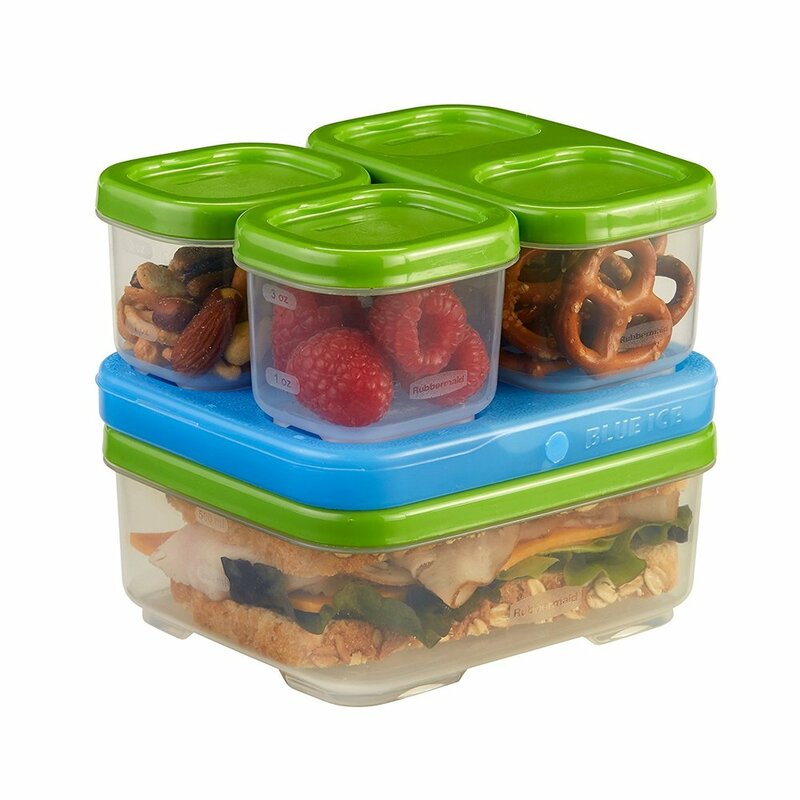 We do still keep a few Rubbermaid Lunch Blox kits around, since they're so handy for packing lunches. Beeswax wraps are a great way to wrap up cheese or a sandwich, or to cover a bowl. For freezing liquids, divide portions into silicone muffin cups. Freeze, then remove the cup and bag for storage. This is a great method for storing frozen soups and stocks, so you can thaw only the portion you need. When not in use, silicone muffin cups nest and compress into very little space. Incidentally, if you feel you need to own a muffin tin, a set of silicone muffin cups and a sheet pan are much smaller to store and work just as well. For a small kitchen pantry, we highly recommend pull out pantry storage cabinets. You can purchase prefabricated storage cabinets (many sizes are available from Rev-A-Shelf), or if you're feeling handy, you can build your own. Inside the pantry, small canvas storage bins are great for storing foods like onions, root vegetables, and tomatoes. (You're not storing your tomatoes in the fridge, right?) These OXO storage containers are fantastic for storing bulk dry goods, especially if you need containers that don't require a strong grip to open. Just push the button on the lid, and the top pops off effortlessly. They can be a little spendy, but OXO storage containers frequently turn up at TJ Maxx or Homegoods if you keep an eye out. If you're storing something that doesn't need to be in an airtight container, you can just leave them in the reusable mesh produce bag you used to get them home from the grocery store. For especially perishable foods like coffee or tea, the Airscape food storage canister can minimize the amount of air in the container to prolong the shelf life of your dry goods. I like to keep fresh fruits out in the open on the kitchen counter, since that prevents the buildup of ethylene gas, and I'm more likely to snack on a fruit if it's somewhere I can see it. Hanging wire fruit baskets are traditional, but my kitchen is too small for that, so I use a wire basket on the counter instead. Keep in mind that some soft fruits like peaches will bruise if they're resting in a wire basket, so keeping them in a bowl or directly on the counter might be a better choice. Spices should be stored in airtight containers out of direct sunlight. Check out our post on salt, pepper, and spices for detailed suggestions. Skip the aerosol cooking spray and keep some cooking oil in a refillable oil sprayer bottle. Keep Reading Part 4: Collapsible Kitchen Tools. The good, the bad, and the ridiculous.